Aids fast healing. Helps soothe pain. Helps reduce the likelihood of scarring. Wound treatment. Minor wounds (e.g. cuts & grazes) and superficial burns. 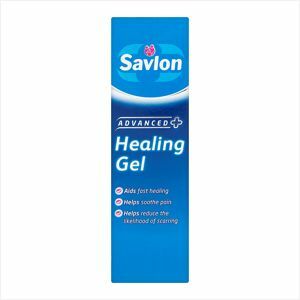 Savlon Advanced Healing Gel's hydro-active colloid formulation can help soothe pain due to its cooling effect. The gel helps create optimal healing conditions to accelerate cell renewal reducing the likelihood of scarring. Wash hands before and after treating the wound. Clean and dry the wound before applying the gel. Carefully apply to the wound without rubbing. Cover the wound with plaster or dressing if necessary and change daily.